Although the sun is shining here in Texas, it’s chilly! 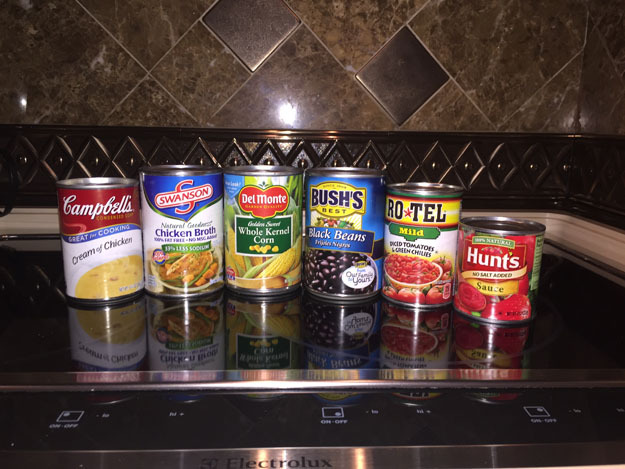 That along with the fact that I’m trying to clean out the Motorhome cabinets of all the canned food we’ve accumulated throughout the year, I decided to make a soup of some sort. 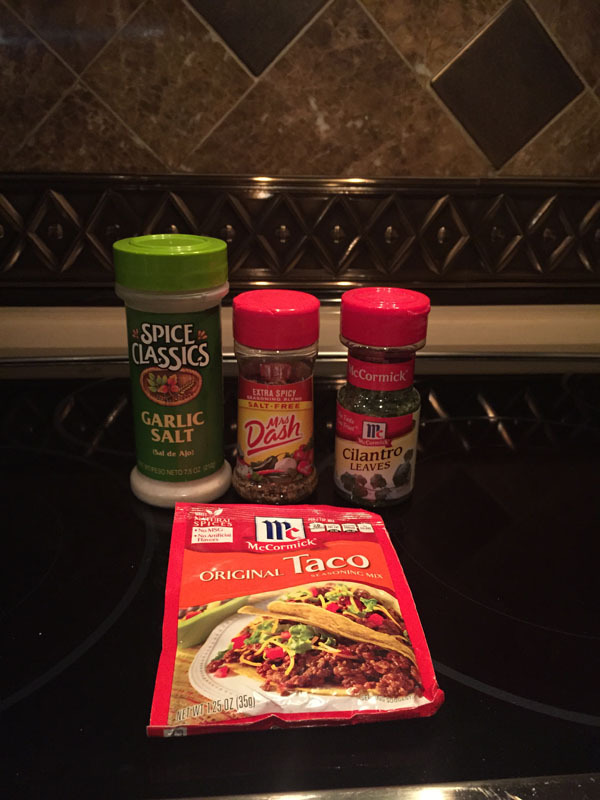 I really like Mexican food right now so I ran with that and what we had in the cabinets! I literally just winged it, throwing in anything that sounds like it would work, flavor-wise, and I have to admit, it turned out AMAZING!! 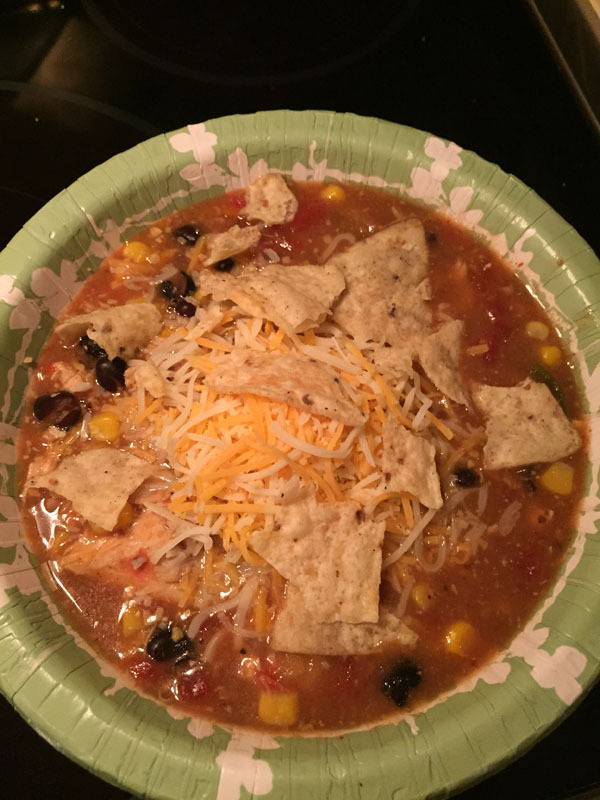 Below is what I did for this super easy, healthy-ish, hearty, Mexican soup. 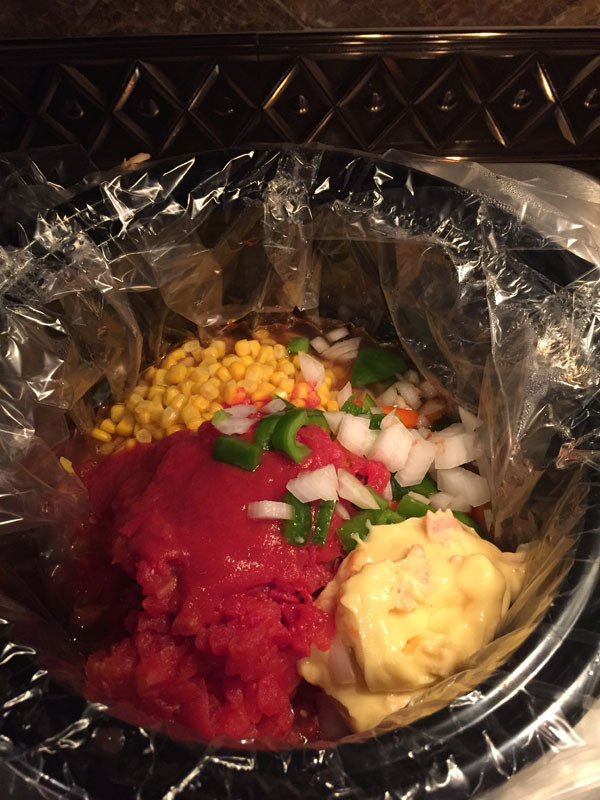 First, grab your Crock-pot and put a bag liner in it because, honestly who wants to scrub dishes after! 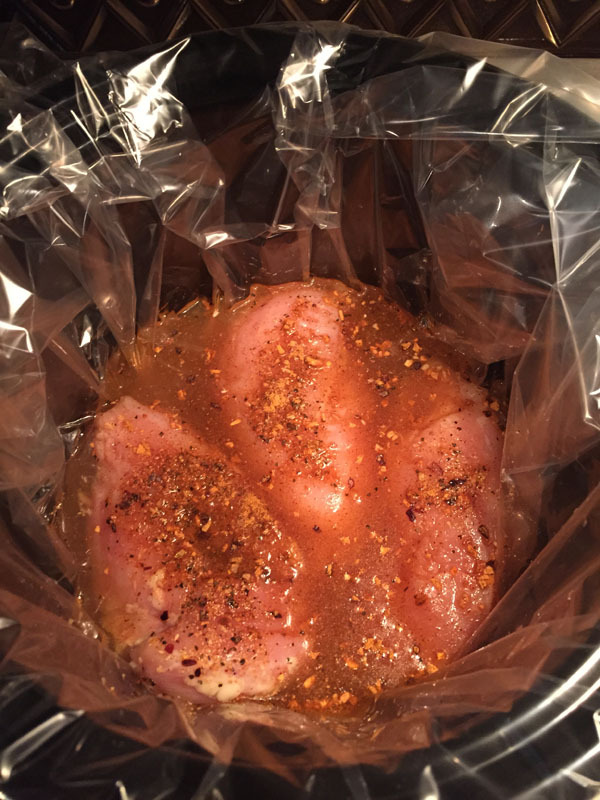 Next, place three chicken breasts in the Crock-Pot with a can of low sodium chicken broth and a few good shakes of taco seasoning along with the Mrs. Dash spice pictured below. 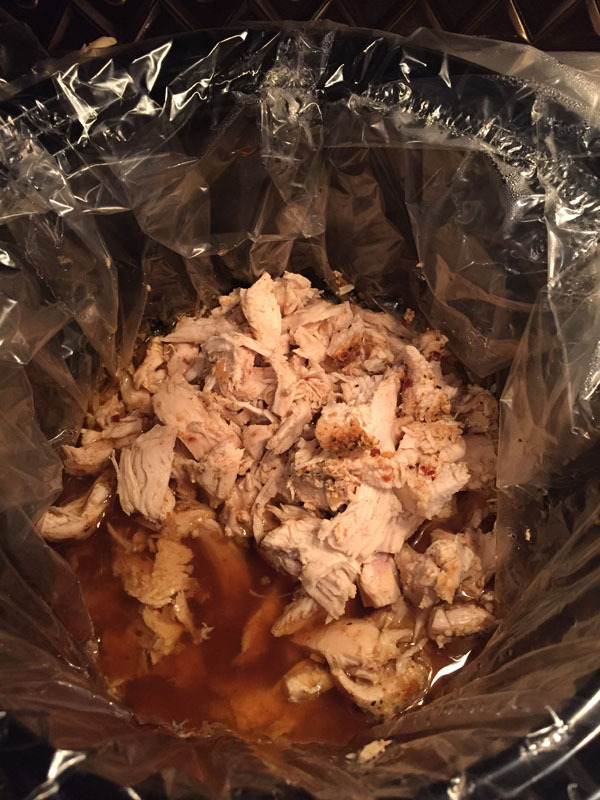 Let the chicken cook on high for an hour and a half, then take it out and shred it. 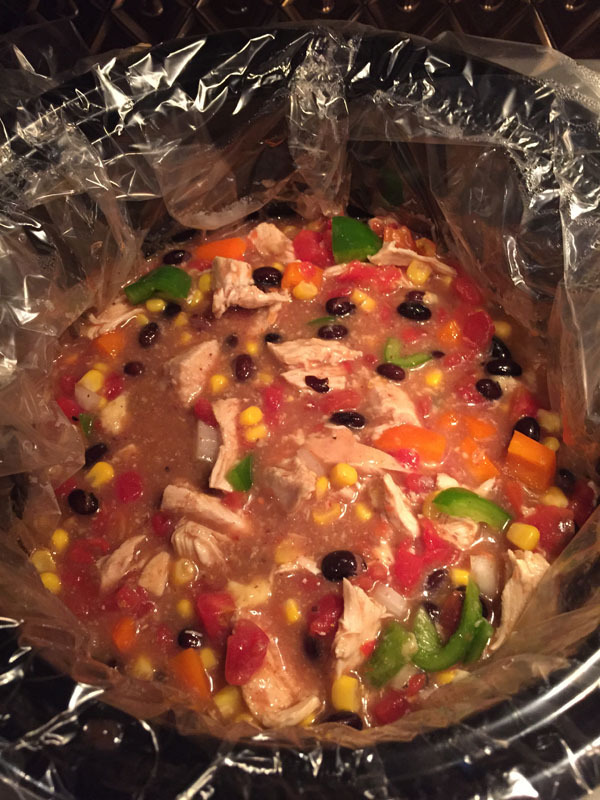 Then, place the chicken back in the Crock-Pot and open and drain the canned veggies. First add the black beans and corn, and then the tomatoes with chili peppers (undrained). After that, add half of the small can of tomato sauce and half a can of the cream of chicken depending on how thick you want it. 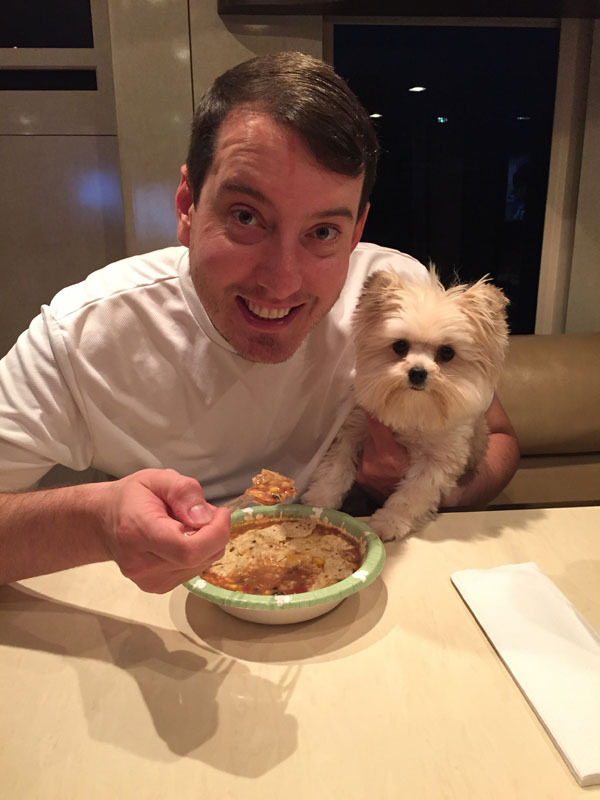 I would have preferred to use fat free cream of chicken but we only had the full fat kind. Like I said I’m cleaning the cabinets LOL! Chop up whatever pepper colors you like, using just a little of each so it doesn’t over power it. I made fajitas with the leftovers since I used just about 1/5 of each color pepper. Then add a very small amount of onion, just enough to give it flavor. I would have really liked to have added some jalapenos but we didn’t have any. From there, let it cook on high heat for two hours and then turn it to low heat for another two hours, so all the flavors can really blend together. When serving it, ads a little squeeze of lime-juice, a dash of cilantro, Mexican cheese and then crush up a few hint of lime tortilla chips on top! It was sooo delicious!! 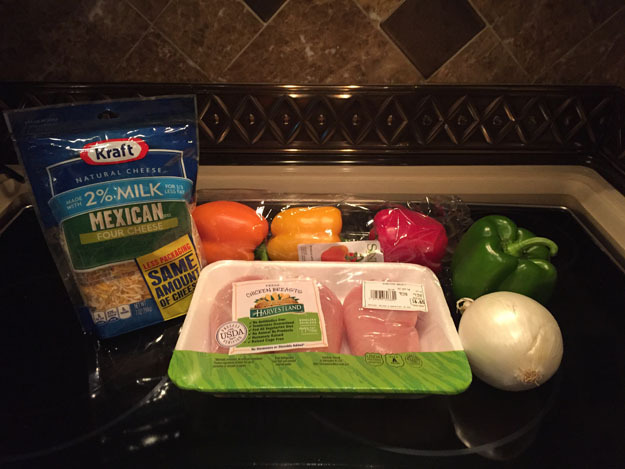 I also think it would taste fabulous poured over Spanish rice! I hope you enjoy it. If you make it let me know what you think!